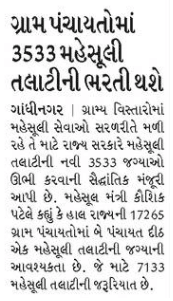 Gujarat Revenue Talati Bharti 2018 – Good news for all Gujarati people, Finally the most awaiting Recruitment of Gujarat is coming.Name of that Recruitment is Gujarat Revenue Talati Recruitment 2018. Talati Bharti 2018 is coming Soon. The government announced Mahesul Revenue Talati Bharti 2018. To ensure easy access to revenue services in rural areas, the state government has given the formal approval to create new 3533 posts of revenue Talati.